In the last number of years, many books have been published about how to engage and do evangelism among Muslim peoples. But few books address the specifics of how to help new believers from Muslim contexts grow in their faith while remaining in their Muslim communities and families. Given that some claim that up to 90% of converts from Muslim backgrounds reconvert back to Islam, discipleship and support of these converts is clearly a critical need in mission work among Muslim peoples. A few months ago, in this blog, I posted a review of Evelyn and Richard Hibberts’ “Walking Together on the Jesus Road: Intercultural Discipling.” Now, I would like to highlight another book in this same vein, speaking even more specifically to the challenges of disciple-making among Muslim peoples – Effective Discipling in Muslim Communities: Scripture, History and Seasoned Practices by Don Little. This book is one of those recommended on our SEND U pre-field reading list for those preparing to serve in Islamic contexts. Don Little worked as a missionary among a Muslim people group in North Africa for 10 years. He now serves as Islamic missiologist for Pioneers, as well as a professor of Islam and missiology at Houghton College. He wrote the initial version of this book as a D. Min. research project, and then rewrote and expanded it to make it more useful for practitioners in missions. Some of the book’s content still resembles an academic research paper, but in its present form, it is highly readable and very practical, particularly Part Two. Part One is entitled “Biblical, Historical and Missiological Foundations for Discipling Believers from Muslim Backgrounds” and is in my opinion, the weaker section of the book. Little chooses an eclectic and somewhat arbitrary selection of biblical texts and historical models from church history to discuss discipleship. It is not always clear what point the author is seeking to make, and the content is a little disjointed at times. He addresses the question of what it means to be converted and emphasizes the importance of repentance and baptism in the biblical and historical understanding of conversion. He looks at how churches such as the Eastern Orthodox church and the Benedictine monasteries have understood spiritual formation. His main point in this section seems to be to show the inadequacy of what he calls the “evangelical modernist” approach to discipleship. This approach is too individualistic and mechanistic and not focused enough on building relationships or the role of the church. This approach assumes that simply teaching new believers various topics from a biblical curriculum will automatically result in inner transformation. Little finds this approach to discipleship to be inappropriate for believers in Christ from a Muslim background. Little addresses contextualization in discipleship in chapter 6. He is not in favor of insider movements and gives three reasons why he is opposed to such an approach. His primary objection to IM is that he believes that insider approaches hinder effective discipleship, which Little believes happens best in the context of a community of faith that boldly identifies with Christ, even at the cost of persecution. Part Two of the book is entitled “Seasoned Practices in Discipling Believers from Muslim Backgrounds.” This second half of the book is based on Don Little’s research. In 2007, he interviewed 75 disciple-makers in lengthy face-to-face interviews. The 75 disciple-makers had a combined total of 839 years of discipleship experience! About half were Westerners and most of the rest were Middle Eastern or African. All of them worked in the Middle East except for 10 who worked among Muslim peoples in Europe. 23 of the 75 were believers from a Muslim background. Little helpfully teases out the differences in perspective between those from a Muslim background and those from a Christian background. Each of these chapters is very helpful and solidly based on the experience of practitioners. Nevertheless, it is important to note, as Little does at various places, that the way these issues would be addressed in another part of the Islamic world (outside of the Middle East) is going to be different at times. What are some of the things that Little emphasizes in describing his understanding of “effective discipling in Muslim communities”? the importance of connecting new believers to a loving, supportive church. Discipleship happens within a community, and not solely in a one-on-one relationship (but individual mentors are still important). The power of corporate worship, honest and vulnerable sharing and caring and praying for each other was often a stronger attraction to Christ than weeks and months of one-on-one conversations and individual discipling. We were not so much inviting them to follow Christ as individuals, but rather inviting them to join a community of those already seeking to grow deeper in their discipleship to Christ. encouraging Muslim background believers to remain inside their Muslim communities whenever possible. the importance of preparing Muslims to face persecution. Persecution is normal for the believer. A key part of the discipleship process is helping the BMBs bring the two parts of their lives together. Their new identity through membership in a Christian community must be reconciled with their former Muslim identity. They need to integrate their two parts into one so that they are known both as followers of Jesus by the Muslim family and as committed believers by the Christian community. Little ends his book with some reservations he has about the recent excitement over disciple-making movements (DMM). He wonders whether those who have adopted this strategy have done so because of an American fascination with numbers and speed, rather than being committed to making resilient disciples that will survive through persecution. 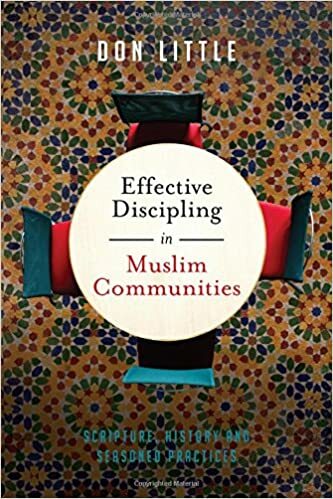 Although this review is longer than most in this blog, I hope it will prove helpful in identifying how “Effective Discipling in a Muslim Communities” might be helpful in your preparation and ministry in making disciples in Islamic contexts.